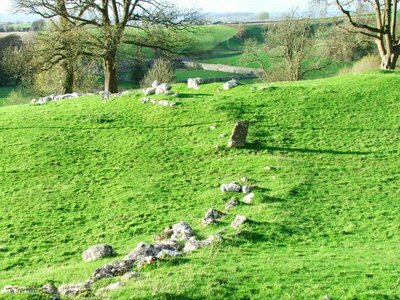 About half a mile and to the East of Burton In Kendal, just off the A6070, lay the remains of the medieval settlement of Dalton. The remains are to the left and right of the driveway that leads to Dalton Old Hall (and the remains of the pele tower there) The settlement would have been inhabited anywhere between 1066 and 1540, and would have been an extensive collection of buildings, enclosures, trackways and farm land\field systems. Above. Possible hut circle or enclosure remains. Enclosures can still be seen in several places. Either as depressions in the earth, or with stones still marking where foundations are buried. There are also the remains of building platforms, large square or rectangular areas where the earth has been compacted to allow the placing of a large building. The site is remarkably well preserved, considering that it probably wasn't occupied after 1540, over 460 years ago. The settlement probably stretched far to the East and the West, but the best remains are in the small area to the east of the drive way to Dalton Old Hall and its pele tower remains. 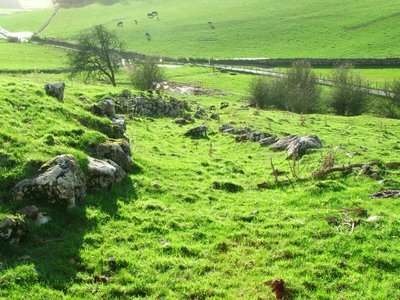 There are numerous deserted medieval settlements in Cumbria, but most either display no evidence, or slight crop marks, only occasionaly visible. Docker a few miles outside of Kendal was reputedly quite a large settlement. The site is next to the railway, and it's likely that any visible remains were destroyed when the lines were laid and the road bridge built. The only other deserted settlement that I've been able to photograph, was Helsington, and even then, the remains were slight crop marks of a long rectangular building, possibly a long house, with two rooms, and some more slight indentations in the field surface. Above. Helsington Deserted Medieval settlement. 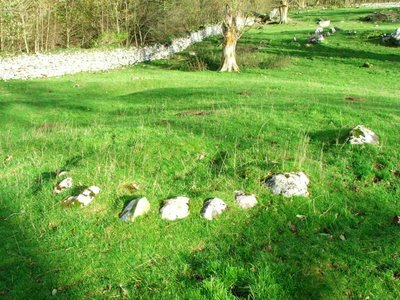 The photo above possibly shows the earthwork remains of the long house at Helsington, or it could simply be the remains of some sort of enclosure. The field in which these remains are sited, is full of slight impressions in the soil, possibly more buildings and trackways. This settlement also dates from around 1066 to 1540, although these dates are only a broad time frame between which the settlement may or may not have been inhabited. There are apparently further earthworks, perhaps relating to the same settlement, 200 metres to the South below the farm buildings. There are further sites at Mint in Kendal, on the banks of the river near Morrisons. Scalthwaiterrigg on the other side of the road and in a field over the other side of the road from Skelsmergh church. As with Docker, there are no visible remains.